GoodBaad aims to be the definitive record of public opinion. Only interested in two opinions (whatever the topic): Good or Baad. 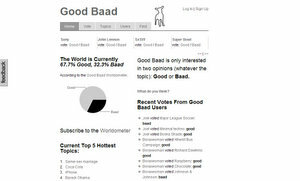 GoodBaad presents the statistics that interest you in the most simple, uncluttered manner possible. By breaking opinions down into the most black and white terms – good and baad. It is hoped that you will see them as a good starting point for thought and debate. We have chosen our sheep based theme due to the availability of the domain name (baad sounds a bit like a sheep doesn’t it?). It also seemed to make (a little) sense that users would be part of a “flock” who share certain opinions.